Acknowledged for the quality of its higher education, France welcomes about 280,000 foreign students every year. Time spent in a French-speaking environment is a workplace asset and makes candidates much more competitive. With about 280,000 international students hosted in 2014, France is the 3rd most attractive country in the world for prospective study abroad students, according to the UNESCO. The reasons for this attractiveness? The superb quality of education and the relatively low cost of schooling. Foreign students can rely on the excellent network of higher education that is found all throughout the country. The origins of this network are in Paris: according to a yearly survey by British research office Quacquarelli Symonds, the French capital is ranked 1st for the third year in a row as "best student city in the world." Over a third of international students in France choose to settle in the French capital. Besides Paris, foreign students also tend to flock to Lyon, Lille, Toulouse, Montpellier, Grenoble or even Rennes. There are many industries in which French degrees are appreciated. Finance, for instance, is one of those degrees… but did you know that recruiters are also interested in candidates who have French degrees in engineering science and IT? French engineering schools are well-known for their exhaustive and comprehensive training. This training includes the acquisition of strong theoretical knowledge, as well as a developed understanding of the industrial sector. As a result, 15.5% of engineers with a French degree found a job abroad, according to a 2014 study by the Association of French Engineers and Scientists (IESF). French higher education is best known for its academic approaches drawn from the Enlightenment Era. It emphasizes abstract thought, as well as scientific empiricism. Higher education institutions all over are gradually adapting this tradition to fit within the context of globalization by developing professional curricula and stressing their focus on the international mobility. 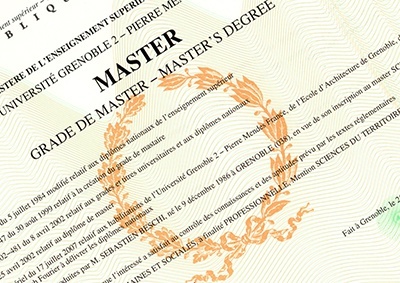 This is the main stake of the European LMD (Licence – Masters – Doctorate) system reform implemented during the mid-2000s. The unification of the university accreditation process implemented in 45 countries (states in the European Economic Area, plus Turkey and Russia) has greatly benefited those in the French education system. In France, Foreign Equivalency Certifications may be granted in NARIC-ENIC centers. In the US, you can request a credential evaluation from two main associations: National Association of Credit Evaluation Services (NACES) and Association of International Credential Evaluators (AICE).